Umstead Park, split between the cities of raleigh and durham, is a treasure chest of great locations for family images. Most people see the trees, the lake, the streams and miss those hidden little spots that have great backdrops and character. This location is the backside of one of the many covered eating areas. The inside, with an open canopy of high ceilings and exposed beams, often dark and a little dreary. However, step through the other side and you find a great simple locations with rustic charm and simple beauty. These steps, weather by years of exposure to the elements, touch with lightly growing moss, is a perfect location for a special image with family. Because of their height, I prefer to have clients sit on them, providing a simple backdrop and great resting area after some time of hiking the trails for other locations. Sitting also helps relax the body and makes your poses much more natural. With the sun setting on the other side of the building, I used off camera flash at a low setting to light the family, allowing them to be slightly brighter than the darker background. 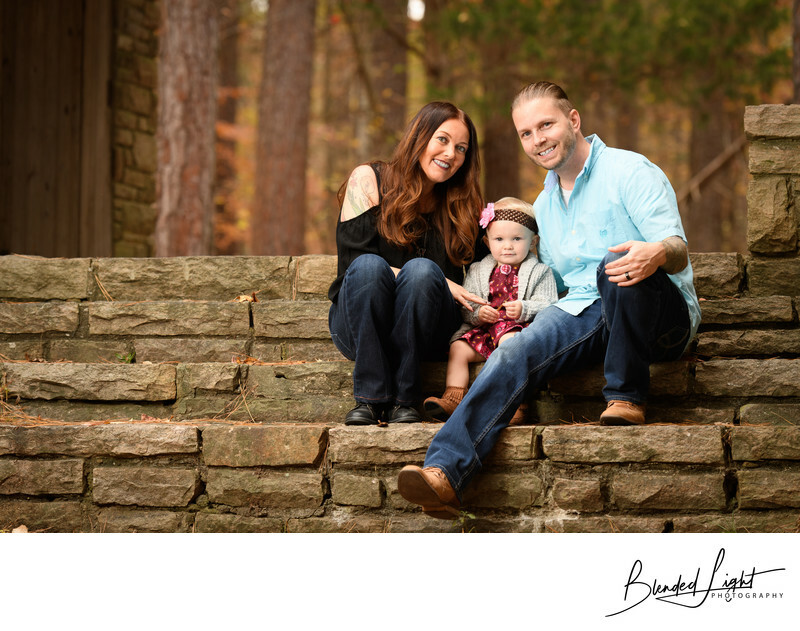 it was a great day with this family in umstead Park and, coupled with the mid-fall colors, led to a beautiful gallery of images, which they and friends have raved about ever since! 1/100; f/4.0; ISO 400; 130.0 mm.